Labeled the "Most Hype-worthy Newcomer" in the wide world of burgers in 2013! 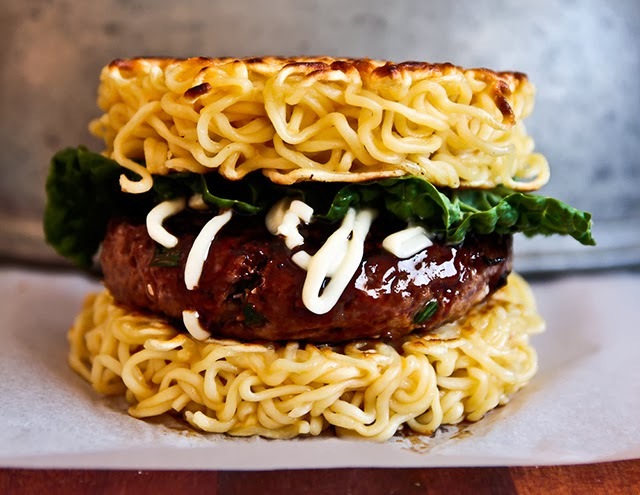 Noodle Naster Keizo Shimamoto introduced his Ramen Burger — yes, a burger with ramen noodle "buns". The Ramen Burger, a meat patty sandwiched between two buns made out of fried ramen noodles, is poised to overtake the hugely popular Cronut as the latest food craze. 1. Cook ramen in boiling water (without the flavour or vegetable sachets) according to directions. Rinse under cold, running water and drain well. Beat eggs and place in a bowl and then using a fork, mix around the ramen in the bowl coating well. 2. Take eight round takeaway containers of the same size (or at least matching pairs so that the sizes of the patties will match) and divide the ramen evenly into the eight containers. Cover with cling film and nest one into another. Weigh down with cans. Refrigerate for 30 minutes. 3. Meanwhile, make the teriyaki glaze by placing all of the glaze ingredients in a saucepan and simmering until it becomes thicker. It takes about 10-15 minutes and just make sure to watch it so that it doesn't burn. 4. While the teriyaki glaze is simmering, make the patties by mixing the mince, miso, mirin, shallots, garlic, sesame seeds, sesame oil and two flavour sachets from the ramen into the mix to flavour it. Divide into four and shape into balls and flatten to round patties and refrigerate until needed. 5. Once the ramen has had its time in the fridge, heat a frypan on medium heat and add some oil. Remove the can and cling wrap and fry the ramen patty until crispy with some browning - it will hold together better if the ramen browns. Turn over and fry the other side. Repeat with the rest of the ramen. 6. Add a little more oil and fry the beef patties on both sides until as done as you like them. Brush the patty with the teriyaki glaze and then place the patty on top of one ramen bun with mayonnaise and cabbage or lettuce. Place other half of ramen bun on top.